Some Americans are readers of Primo Levi, especially after his extraordinary Periodic Table wastranslated into English and praised by such writers as Susan Sontag, Philip Roth and Saul Bellow. And some Americans are conscious of the long-running debate on the role of the Vatican and Pius XII during the Nazi occupation of Italy. But few Americans—or Italian-Americans for that matter—are familiar with the plight and influence of 2,000 Italian Jews who fled fascist Italy under the most difficult circumstances after the appearance of the “Manifesto of the Racial Scientists” in the summer of 1938 and the subsequent promulgation of anti-Semitic legislation—based on the notorious Nuremberg Laws of Nazi Germany—several months later. 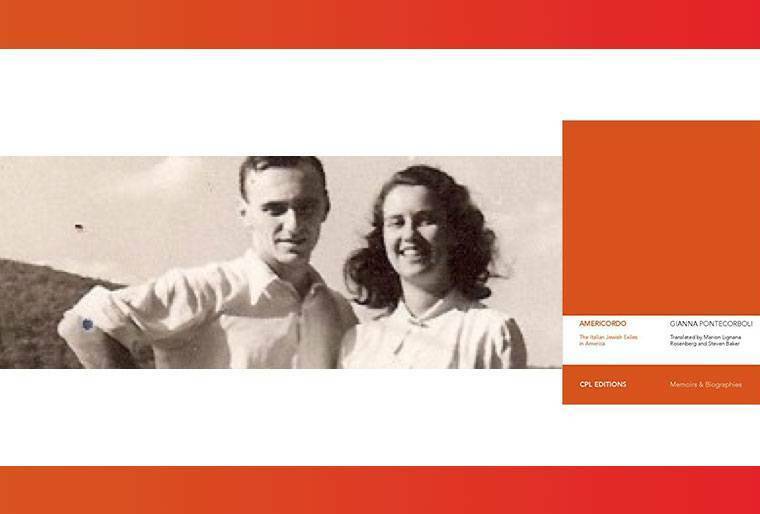 Now, Centro Primo Levi Editions has published an English translation of Gianna Pontecorboli’s Americordo, and the story should be better known. Pontecorboli’s writing—admirably translated by Marion Lignana Rosenberg (who died tragically during the project) and Steve Baker of Columbia University—is clear and direct, thankfully fee of the rhetorical excess that sometimes accompanies the subject. This book is a humble homage to the history of some 2,000 Italian Jews who crossed the ocean to flee the Fascist regime’s unjust racial laws, having understood early on the tragedy in which those laws would culminate only a few years later. This story has never been told in its entirety, though many of the exiles have written books and personal memoirs. When fascism came to power in 1922, some Italian Jewish families welcomed the new regime, an indication of how assimilated into the communities had become. With no anti-Semitic platform to speak of (but numerous anti-Semites in their ranks), the fascists didn’t appear at first to be as dangerous as their German counterparts. Italy had Jewish prime ministers and Rome had a Jewish mayor when France—home of the Enlightenment—was convulsed by the Dreyfuss Affair. Were not the Jews of Rome the “Pope’s Jews”? Had not Mussolini promised to protect Italian Jews since “they had wept at Caesar’s tomb”? But by the mid-1930s all had changed and the first Italian translation of The Protocols of the Elders of Zion, while little noticed at the time, was an ominous shot across the bow. By the fall of 1938, thousands were faced with a wrenching decision: to stay or go into exile? It was a disparate group. In addition to architects, musicians, artists, journalists, designers, mathematicians, and no less than three later Nobel Prize winners, there was a seamstress, a door-to-door salesman . . . This is a collective portrait of ordinary and extraordinary people; a polyphonic biography. Appropriately enough, the story begins with Pontecorboli recalling the arrival back in Italy of an aunt and uncle who had fled in 1938. Author Gianna Pontecorboli was born in Camogli (Genova), earned a degree in Economics from the University of Genova in 1968 and has had a distinguished career as a journalist in Italy and the United States. She writes often about politics, culture and the economy. Currently, she is the UN and US correspondent for the Swiss newspaper Corriere del Ticino; she is also a writer and founding partner of the online paper Lettera 22. She kindly and graciously responded to several questions about the book. Obviously, this is a very personal work. Can you explain how the idea came to you and your own history? “I think the most interesting thing may be to talk about how this book was born. I’d like to start with a small, personal story. A few years ago we organized a family dinner in Genova. We were five cousins who came from three different families. At a certain point the conversation came around to the “American uncle,” my mother’s brother who had decided to move to the US together with a cousin shortly after the passage of the Racial Laws. Do you discern a difference (ideological, psychological, political, cultural) between those who choose exile and those who remained behind? Was there any antagonism between the two groups? What personal and intellectual qualities did the exiles carry that helped them become successful in America? “Obviously cultural and intellectual qualities played a major role. One of the factors was the idea that they had lost their support system and they had to prove themselves in the new world. The friendship of the other exiles and the help of different organizations like the Spanish and Portuguese synagogue were crucial to reassure the weakest." How is this history of Italian Jewish exiles understood today in Italy? The nearly four-dozen black and white photographs evoke a world we forget at our peril. From Rome, Milan, Fiume, Venice and dozens of other Italian towns and cities, to New Haven, CT, Cold Spring Harbor, NY, Princeton, NJ, it was another chapter in the millennial history of the Diaspora. With a useful bibliography, 80 short biographies and a preface by Furio Colombo, this is a valuable and necessary book that will appeal to both scholars and general readers alike. Stanislao Pugliese is the Queensboro UNICO Distinguished Professor of Italian & Italian American Studies at Hofstra University. AMERICORDO: The Italian Jewish Exiles in America, by Gianna Pontecorboli; translated by Marion Lignana Rosenberg and Steven Baker; Centro Primo Levi Editions 2015; 380 pp. paperback, $12.00; available as an ebook; primolevicenter.org. Reading and Discussion with author and Judge Guido Calabresi, Monday, March 28, Casa Italiana Zerilli-Marimò NYU, 24 West 12th Street, 6:00 p.m.